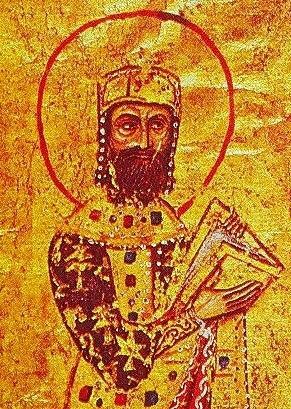 Alexios I was Byzantine emperor from 1081 to 1118. Although he was not the founder of the Komnenian dynasty, it was during his reign that the Komnenos family came to full power. Inheriting a collapsing empire and faced with constant warfare during his reign against both the Seljuq Turks in Asia Minor and the Normans in the western Balkans, Alexios was able to curb the Byzantine decline and begin the military, financial, and territorial recovery known as the Komnenian restoration. During the last twenty years of his life Alexios lost much of his popularity. The years were marked by persecution of the followers of the Paulician and Bogomil heresies—one of his last acts was to publicly burn at the stake Basil, a Bogomil leader, with whom he had engaged in a theological dispute. In spite of the success of the First Crusade, Alexios also had to repel numerous attempts on his territory by the Seljuqs in 1110–1117. He was for many years under the strong influence of an eminence grise, his mother Anna Dalassene, a wise and immensely able politician whom, in a uniquely irregular fashion, he had crowned as Augusta instead of the rightful claimant to the title, his wife Irene Doukaina. Alexios' last years were also troubled by anxieties over the succession. Although he had crowned his son John II Komnenos co-emperor at the age of five in 1092, his wife, Irene Doukaina wished to alter the succession in favor of their daughter Anna and Anna's husband, Nikephoros Bryennios the Younger.